Picture this: a very young Pat Lipsky, only recently out of Hunter College’s MFA program, painting up a storm in an era when a youthful color-field painter with a clear, true color sense & a genuine pedigree in Frankenthaler & Noland could still turn out big, lush, truly lovely pictures, and win shows of them at a prestigious 57th Street gallery, plus a rave review in the New York Times! 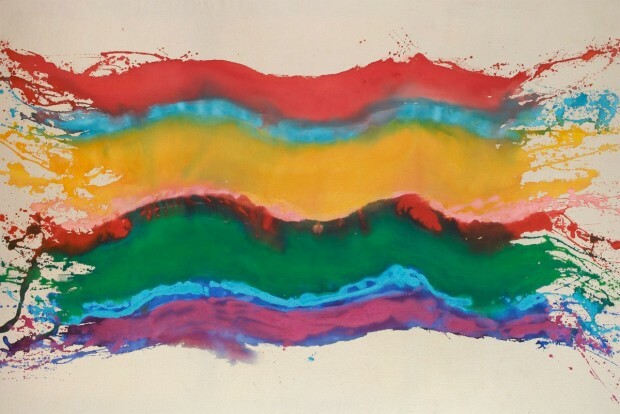 Those were the days, my friend, we thought they’d never end, but at any rate, they are currently and most happily being revisited with a lovely little show at Gerald Peters, on the Upper East Side, entitled “Pat Lipsky: Stain Paintings 1968 – 1975” (through May 5). Though I met Lipsky in the 1980s, the first time I can recall begin bowled over by her work was in the brilliant exhibition of “black paintings” staged by Lori Bookstein in 1997. True, I’d seen a number of these paintings prior to the Bookstein exhibition, and admired them then, but their comprehensive presentation in the gallery situation augmented their effect. Those paintings were geometric and composed around squares — or diamonds — and since then, the abstract work by Lipsky that I’ve seen has continued in this geometric vein. While it is usually very fine, it is also more familiar to me than the earlier paintings in the Peters exhibition. If I’d seen any of this earlier work it can have been only isolated examples, so once again the group presentation must have helped to make the difference. Of two large paintings in the Peters show with a vertical orientation, I liked the freely-formed blotches of apple green and pink in “J. J. Flowers” (1974) better, even though it represents a direction that the artist doesn’t seem to have pursued further. Of the seven large and loosely-configured horizontal paintings on view, the soft deep blues and deep greens of “Winter” (1971), were also very likeable, though again its broad, overlapping horizontal bands of color, covering the entirety of the canvas, represented a road not taken further by the artist. The three paintings that I found irresistible – if only because they were so totally unfamiliar to me – were “Glowing” (1970), “Butterfly” (1971) and above all, “Springs Fireplace’ (1969). In all three cases, quantities of very liquid, somewhat splashy paint has been freely applied in a group of more or less wavy horizontal bands of color, placed in the center of the canvas, and surrounded by open space. At 77 × 101 inches, “Butterfly” is overwhelming by its scale, and a most creditable performance, but the slightly smaller “Springs Fireplace” (with its Pollockian title) is the splashiest and most exuberant. Its multicolored horizontal wavy bands of color end in splashily-isolated lines at each side of the image, suggesting a vigorously agitated multicolored shawl with hyperkinetic fringe—pure visual freedom & joy!